Order now at your local store, book stores such as Barnes & Noble, or online at retailers like Amazon. You can also find Volo's Guide available via Fantasy Grounds and Steam, as well as via Roll20 and D&D Beyond. Volo's Guide to Monster also comes in a limited edition format, exclusive to core hobby stores, featuring an alternative-art cover, beautifully illustrated by Hydro74. This version of the book will only have a single printing. Use the store locator to find a hobby store near you. A look inside the book's contents! Read the Table of Contents. An introduction to the guide, by Volo. Read the preface. From Chapter 1, further lore on giants. From Chapter 2, race options for the firbolg. From Chapter 3, a look at the froghemoth. 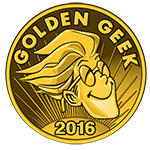 The winners of the 2016 Golden Geek Awards have been determined by the users of BoardGameGeek, RPGGeek, and VideoGameGeek.